Own the world's top brands in the Monopoly Empire game! Choose one of the uniquely branded tokens, move around the board and start building your Empire. Buy your favourite brands one by one and slide their billboards onto your Empire tower: the game is a race to the top! Collect rent from your rivals based on your tower height. And be the first player to fill your tower with billboards to win. With the Monopoly Empire game, you can own some of the biggest brands in the world! Every space on the board is an iconic brand, including Xbox, Coca-Cola, McDonald's and Samsung! Splash your Monopoly cash to build your Empire tower as high as it can go. You'll need to make tough decisions and smart moves to take down the competition and be the first to reach the top. 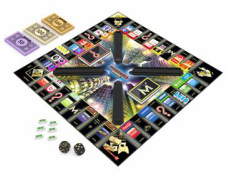 Hit the big time and own the world's top brands with the Monopoly Empire game! Buy and trade the world's top brands and be first to the top!